Sony KDL-26EX320 review | What Hi-Fi? At first glance, £380 seems a lot of money to pay for such a small TV. Only when you delve into this Sony’s specification does that price begin to make sense. Sony hasn’t allowed its dimensions to dictate this TV’s features. Among its rivals, only the Sony features edge-array LED backlighting, or integrated wi-fi for streaming from a home network – or Sony’s own extensive online facilities. Only the Sony is Skype-ready, has a smartphone control app or a ‘presence sensor’ that switches the TV to standby if you get up and walk away for a while. Even the table-top stand is an elegant cut above the norm. The Sony has extensive set-up options, but under no circumstances could we get a particularly bright picture – and it’s even dimmer when seated off-axis. Yet, in every other respect, its picture-making ability is formidable. Downscaling a Blu-ray of True Grit, it’s the prodigious detail levels, secure motion handling and convincing textures that are most immediately impressive. A wide-ranging colour palette and smoothly rendered edges aren’t far behind. The Sony does solid work when asked to upscale DVDs and TV broadcasts, too. There’s still no particular punch to contrasts, but black tones are detailed and whites clean, while motion, detail and edge definition all lead the field. 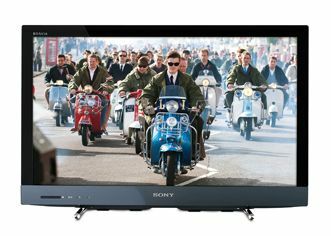 The EX320 is as prone to picture noise as any of its competitors, but it does good work with colours and textures – when it comes to delivering standard-definition pictures, this Sony is the most accomplished screen here. Considering its slim, 4cm chassis, the EX320 sounds quite spacious – there’s an openness to the sound that’s at significant odds to the majority of its competitors. It’s pretty well balanced too, though the high frequencies are the aural equivalent of a paper-cut. So, in most respects the Sony is admirable – if only the pictures were punchier, and the sound not quite so.